Information: The tradition of the Yianitsari and Boules is the heart and main feature of the famous Carnival (Apokrias) of Naoussa which takes place just before the forty days of Lent that preceeds Orthodox Easter. Related to the French Mardi Gras and German Fasching, it has, seemingly, its origins in the celebrations of Dionysos of Ancient Greece. According to historical documentation by Takis Baïtsis, the present day form of the celebration first took place in 1705 when the Turks first came to the area for the "pethomazema" (the taking of young boys to become Janissaries1) which was the last attempt of this sort in Naoussa during the Ottoman occupation. The inhabitants of Naoussa refused to comply to the order and killed the emissaries that were sent to accomplish this. Under the leadership of Zissi Karadimou and his two sons Vasili and Dimitri a resistance army was formed, but was later annihilated by the Turks in retribution. The following year as a memorial tribute to the dead, the citizens of Naoussa originated the Armatolitki costume (see photo), covered their head and faces and roamed the streets in the same manner as those singled out to become Yianitsari. The ancient route that was taken at that time is still followed to this day. Only unmarried, single, young men are permitted to become Yianitsari and Boules. A few days following Christmas the traditional clothing and accessories were assembled in preparation for dressing the young men who will lake part in the tradition. It must be noted that this traditional celebration is a sort of "ritual rite of passing" for all young men in Naoussa and to this day everyone takes part in it. 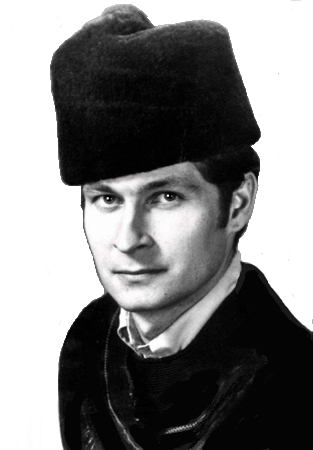 The costume consists of a red fez with a black tassel, a wide-sleeved shirt which was embroidered in red or white silk thread in the herringbone pattern (psarokokkalo) on the front and collar. 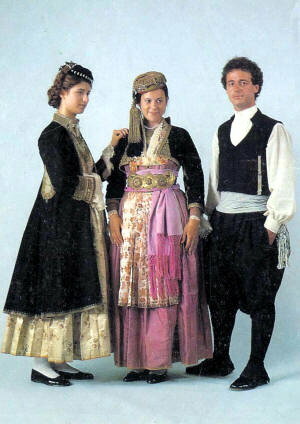 The most crucial piece of the costume is the foustanella whose length is approximately one foot above the knee (this length differentiates it from the foustanella of mainland Greece which is longer) and has between 250-400 pleats. The pisli was a type of vest usually made out of velvet or fine quality wool material which was embroidered with corded thread. A Selahi, a very elaborately carved leather belt was worn over the zonari (sash) and was used to carry money, pen and ink, pistols, or knives. The legs and feet were covered with light weight white woolen stockings, accessorized with black tassels worn above the knee and sturdy black tsarouchia (footgear with pom-poms). The costume was relatively easy to find, it was the silver accessories and jewelry that was hard to find. The front of the chest is covered with a vest like garment on which silver coins, roupia from the 17th, 18th, and 19th century have been sewn on. The coins were usually French or Austrian and hung on chains. In more recent times the coins are sewn directly on the vest. The top part of the vest is covered with giordani (a type of very ornate silver necklace). Originally the sewing of the coins on the vest took place on Saturday night, the eve of Apokrias, and lasted all night. It was the duty of the older Yanitsari to dress the younger ones and was a very tiring ordeal. The Kiousteki is the most elaborate piece of silver jewelry and covers the entire back of the vest. The vest was also decorated with silver figures of saints, St. Sophia or the double eagle, symbol of Byzantium. The head and face are covered with a mask. The mask is made of plaster and wax and has approximately 5 meters of woven fabric attached to it and covers the entire head. The openings for the mouth and eyes are very small because large eyes and mouth were considered unattractive and ugly. The white color of the mask symbolizes the mortality of nature and more specifically of Hellenism and the red cheeks the rebirth of hope for the restoration of freedom to the enslaved nation. These details have been documented from elders who have passed them down from one generation to other. Once the mask is put on, it cannot be removed for the entire day or until the ceremony of the Boules comes to end. While the Yianitsari are dressing, the door of the home is always left open for friends and relatives to drop in with wishes and to be treated to a sweet or drink from the hostess. Once the Yianitsari are dressed, they go from house to house picking up other Yianitsari and Boules the mazema (assembly) and form the Boulouki (troop). The Boules are men who are dressed as brides. The Boulouki is accompanied by zournades and daouli who play popular Macedonian songs from the early 1900s. During the Turkish occupation (which lasted until 1912 in some areas) the troop proceeded to the konaki (government office or mansion) of the Moundiri (mayor). 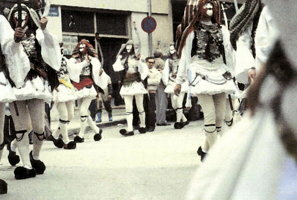 For the present day celebrations, the boulouki proceeds to the City Hall where the leader of the boulouki asks permission from the mayor to begin the celebration. 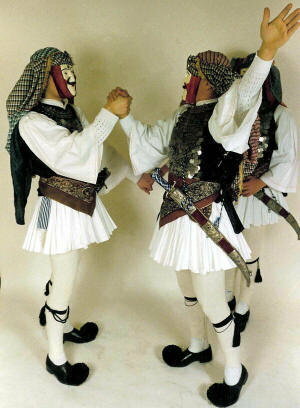 The lead Yianitsaros and Boula appear before the mayor, remove their masks so the mayor can see their faces and be reassured that they are not enemies and grants them permission to begin the procession. The Boula bows before the mayor and he gives "her" an asimona (donation of silver or money). The boulouki is now ready to proceed to the main square for the dancing and glendi followed by the ceremonial procession of going house to house collecting donations. During the Turkish occupation the asimona consisted of not only money, but also guns and gun powder and new conscripts in order to continue the war of liberation against the Turks. The tradition of Yanitsari and Boules has taken place in Naoussa for the past 300 years without any interruption from foreign influences. It is a memorial tribute to the brave warriors who gave their lives for the liberation of Greece from the Turks. The tradition is passed on from generation to generation and remains unaltered from that time. It is believed that this tradition dates back much earlier than 1705 and had its beginnings in ancient Greece as part of the Anthesteria which were ceremonial festivities dedicated to Dionysos. 1Janissaries or Yianitsari  A powerful Turkish military fighting unit composed of Christian subjects, recruited and trained when young. One fifth of all Greek children were forcibly taken every five years.